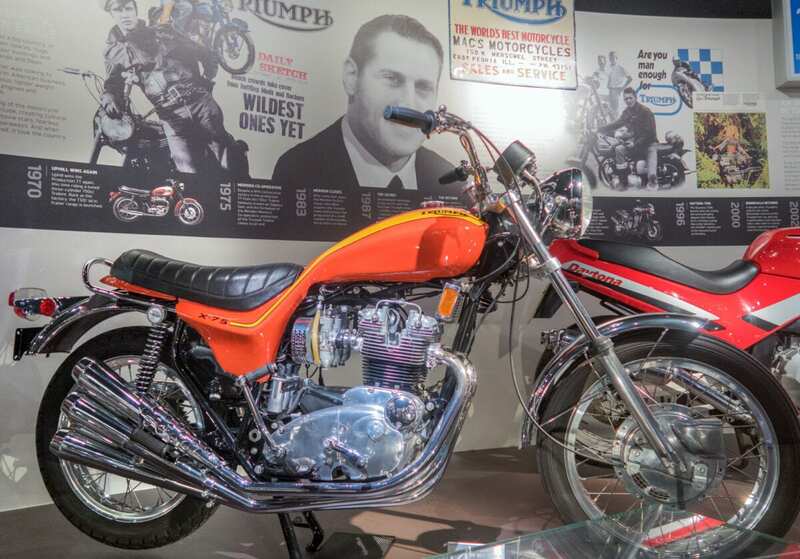 The Triumph Visitor Experience opened back in February, and recently my friend John announced he had a spare ticket for the Factory Tour, reports RC regular Richard Jones. This seemed like an excellent opportunity for Tessie the Triumph to return home for a visit. And so it was that John and I both went along on our Triumph T100s on a very hot – and very sunny – June day. 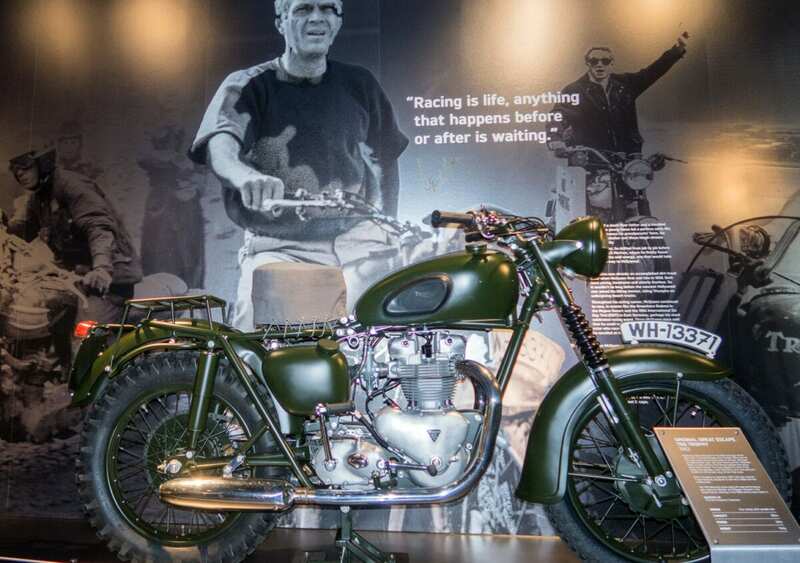 As you would expect from Triumph, the whole Experience has been designed to provide a quality visit to the factory. 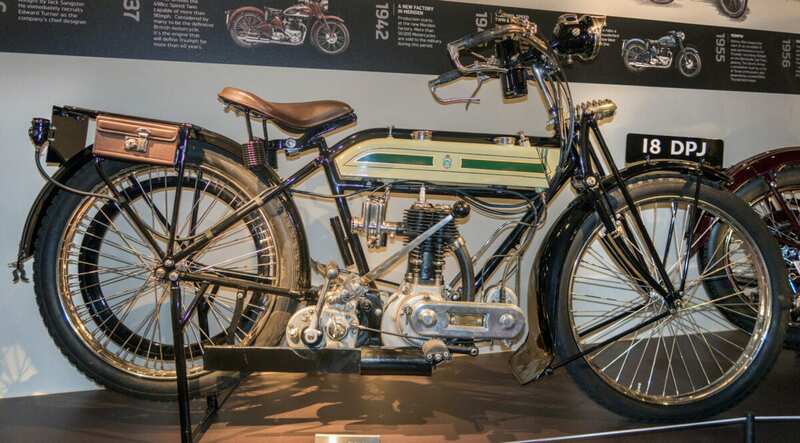 There’s an exhibition, set over two floors, of the history of the marque which starts with the very first machine from 1902, continues through the halcyon years of the mid-20th century and on to the present glory days of the resurgent brand. There’s a shop selling Triumph merchandise and, for the weary traveller, a well-stocked café with some rather good coffee. However the best part has to be the Factory Tour which, at £15 for an hour and a half, is excellent value for money although you will need to book in advance. Our tour guide was Kenny Shepherd who, as you will see from a glance at the TT Database, has had quite a career at the Isle of Man; what’s more he’s from North Wales so as close to perfection as could be expected. The tour starts at a map of locations for Triumph’s factories and dealerships across the globe – as well as the UK there are factories in Thailand, India and Brazil, the latter two assembling bikes transported to them in kit form to avoid the massive import duties on completed machines. We then pass through a huge area of full-height racking with hundreds of Triumphs ready for delivery all over the world. 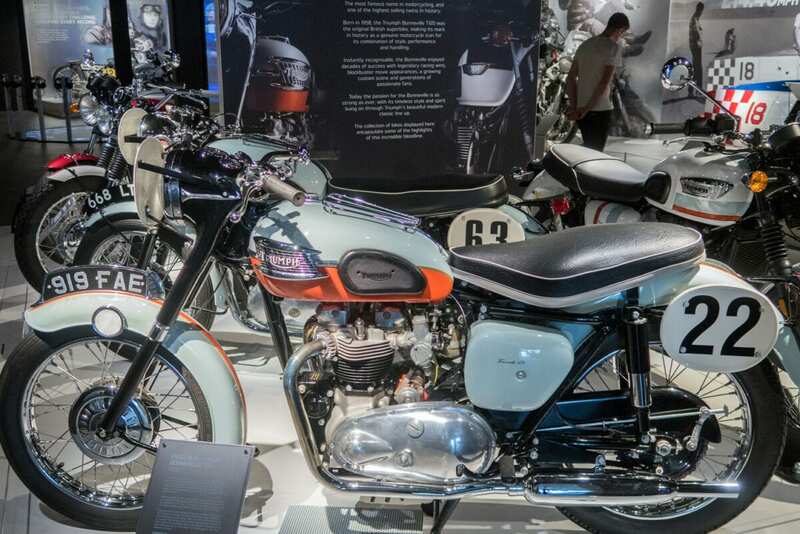 Each is coded with its destination and they seem to go everywhere – who would have thought of Triumph selling its machines in Zambia back in the 1960s? How all this is managed is mind-boggling and you can’t help but admire the logistics behind it all. All of the crankshafts in all of the Triumph motorcycles around the world are made in Hinckley. They’re machined from castings in a matter of minutes by some impressive pieces of kit but require more than a day of various heat treatments to ensure they will keep functioning for six-figure mileages. The factory also machines the crankcases and camshafts for those bikes which are assembled in the UK. At the end of each machining process, the components are checked on a sampling basis to ensure that they reach Triumph’s meticulous and micron-level quality standards. Anything not measuring up is removed and the previous components checked too to identify if they have issues. 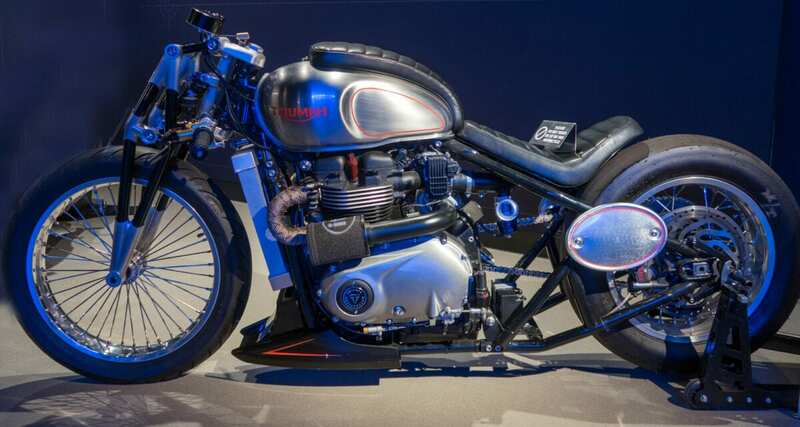 A big investment has also been made recently in a state-of-the-art paint shop where, once again, the intention is that your Triumph’s paintwork will last and last. Throughout the tour you are left in no doubt that Triumph is committed to a quality product. We then move on to the area where the bikes are assembled and, once again, it is clear that there has been a huge investment in factory tooling and IT to ensure the best quality feasible is achieved. One of the most interesting facts for me was that of the 600 or so people employed at Hinckley more than half are involved in Research and Development. This demonstrates a commitment to the future perhaps lacking in the previous Triumph incarnation. The department is, unsurprisingly, concealed by a full height, unglazed wall (at least to the factory side – presumably they don’t work in the dark) and is very off-limits to the Factory Tour. That being said we did see some of the engines that are being supplied for the 2019 Moto2 – Triumph Motorcycles has been chosen as the exclusive engine supplier for the Moto2TM Championship from the 2019 season onwards. There was also mention made that the Rocket 3 is no longer in production as it was unable to meet the latest Euro standards; it seems unlikely that all that expensive tooling will remain idle for long – perhaps something even bigger is planned? 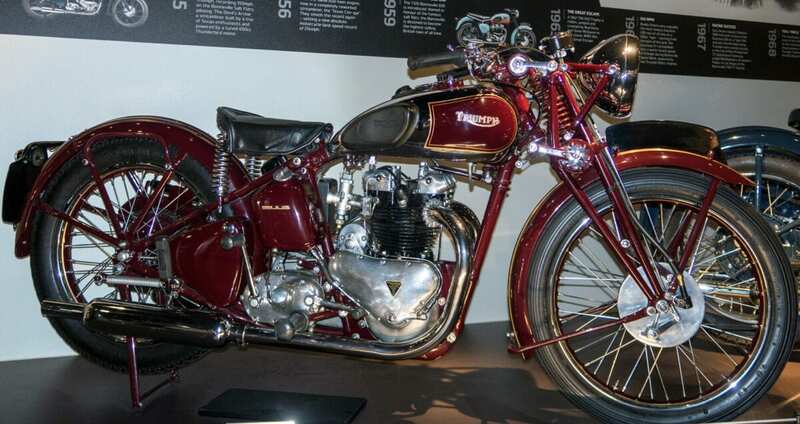 There are some who will say that a Triumph is no longer a British motorcycle. My view is that we live in a global economy. To believe that it would be cost effective to source all the components required to manufacture large quantities of motorcycles from the UK is, at best, naïve. 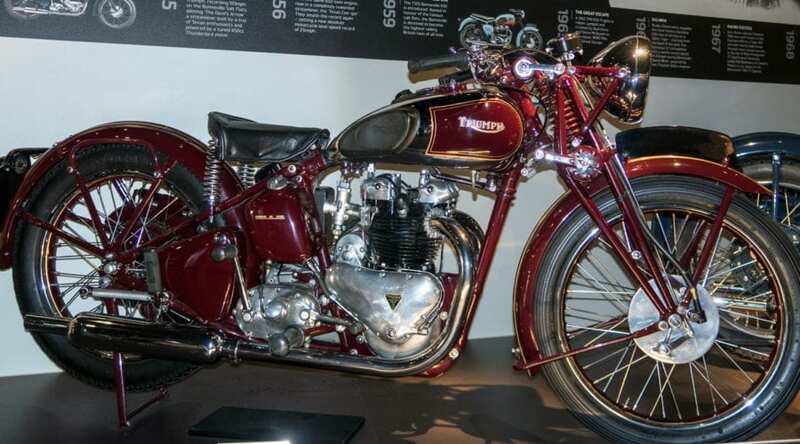 Triumph is close to manufacturing its millionth machine – will there be a party? – and, as any major manufacturer will tell you, one factory in one country which provides all the components is simply not feasible. However the one thing that is British through and through is the drive, commitment and downright courage that John Bloor and Triumph have demonstrated to make the marque a truly global brand. They are to be applauded. There is no photography allowed in the factory for obvious reasons but there should be some photos hereabouts from the Exhibition. If you would like to go on the factory tour – and I can recommend it highly – then go to www.triumphmotorcycles.co.uk/visitor-experience/factory-tour.